Click it to get in there! About a year ago, there was this thing going around on Facebook where people were doing some sort of version of Pay it Forward where you were supposed to leave a comment on someone’s wall and then they’d send you something awesome. I posted a satire — Pay it Backward — asking people to send me something awesome and I’d repay them with a blog post. Well, a few days afterward I received a huge envelope in the mail. It was from my buddy Nathan Pierce, whom I’ve known for years as one of the “Poway Posse” — a rag-tag group of high-school hooligans Darlene and I met at the first year we had a Cool Jerk table at San Diego Comic-Con. The contents of the envelope are above, and it came with a note. I shall paraphrase and guide you through the exhibit. • The first thing you’ll likely notice is the dinosaur drawing. I’ll save that for last. But on top of that drawing is a Gandalf for President button, courtesy San Diego Comic-Con. • On the right is a Reader’s Digest that Nathan bought at London Heathrow after spending several weeks backpacking through Europe and studying abroad. He says the Princess Di story caught his eye, and was apropos of the location. • South of that is Darwin Awards II, a mainstay read through high school proving influential on his sense of humor. • There are two poker chips from Las Vegas. I’m not certain if they have any cash value… but I’m encouraged to find out! VEGAS, BAY-BEE!! • A modest stack of baseball cards, which is a fraction of Nathan’s collection (along with poker chips, apparently a hobby that’s fallen by the wayside of late). • A Hard Rock Café shot glass. I initially thought it would’ve been from La Jolla but I couldn’t be farther off. It’s from Maui. Instead of collecting shot glasses as mementos of his travels, he now opts for postcards. • There’s a Home Alone Game Gear cartridge there, holding open a little hardcover book on how to make shadow puppets. Nathan says he used to play the Home Alone game all the time as a kid, but the book was given to him by a former roommate. 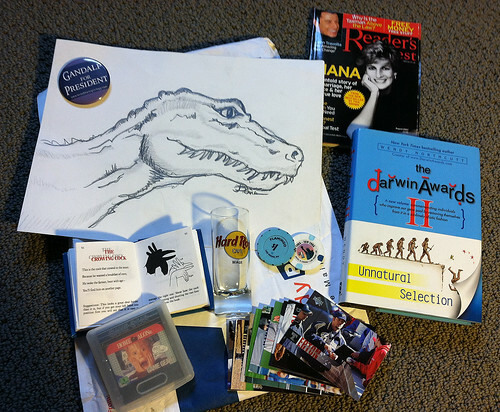 • The dinosaur drawing was drawn by Nathan’s friend Joe DiAnna, who, as a fellow founding member of the “Poway Posse,” is also one of my friends for more than a decade. What’s weird is that from the first glance I immediately knew that Joe was the artist. The story behind the drawing involves a midnight run to Mexicali, drunken debauchery, some gunplay and a bet. Or San Diego Comic-Con. Nathan was kind of sketchy on this. So anyway, there you have it. Today is Nathan’s birthday and I think it’s a good a time as any to fulfill my obligation and post this tale for all to see. Thanks again, Nate! I’ll dedicate my upcoming episode of “Hoarders” to you!